Pros: very compact design that feels solid and well made. Lightweight and easy to carry and transport. Quite bright for a compact, with good all-round image quality. Large focus wheel for a compact and good quality twist up eye cups make these very comfortable in use. They feel like a “proper” pair of binoculars despite their compact size. Cons: strap lugs dig into my hands when I hold them normally. Focus is perhaps a little aggressive (just under 1 full turn from close focus to infinity). At this price point I think it’s fair to expect phase-corrected coatings on the prisms, which I think is missing. Relatively shallow depth of field means lots of refocussing. Single hinge design makes them less “pocketable” than dual-hinge compacts. There’s no doubt that the Minox BV 8×25 is an accomplished little compact binocular. It does a lot of things very well, but I can’t shake the feeling that it should deliver a little more “punch” in terms of overall image quality. While it is certainly very compact, and feels extremely robust, the single hinge design means it can’t fold down like dual hinge compacts do — and that makes it a lot less pocketable. For me that diminishes its usefulness as a carry-anywhere binocular, which is the only reason I’d choose a compact. On the flip side the single hinge design is less “fiddly” in use, means your binoculars are always ready, and makes them feel much more like “real” binoculars in the hand. 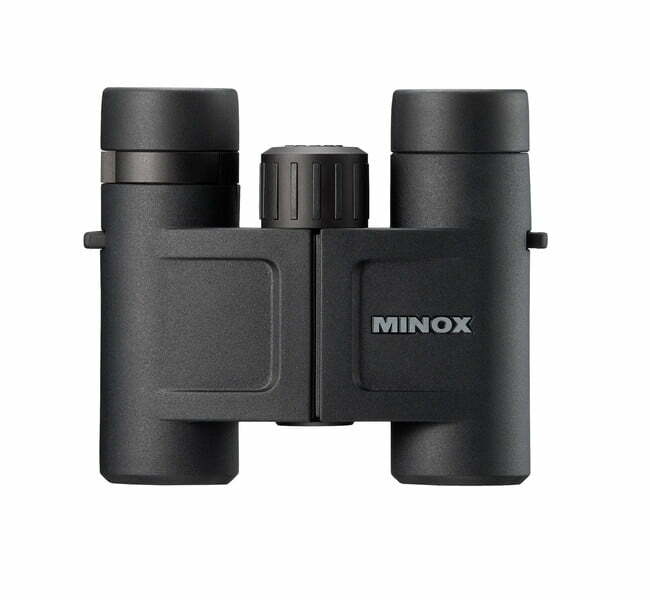 In summary, if you’re looking for a good quality, reasonably priced compact binocular from a well known manufacturer in this price range, and are comfortable with the single hinge design, then the Minox BV compact in 8×25 or 10×25 flavours is a worthy contender. 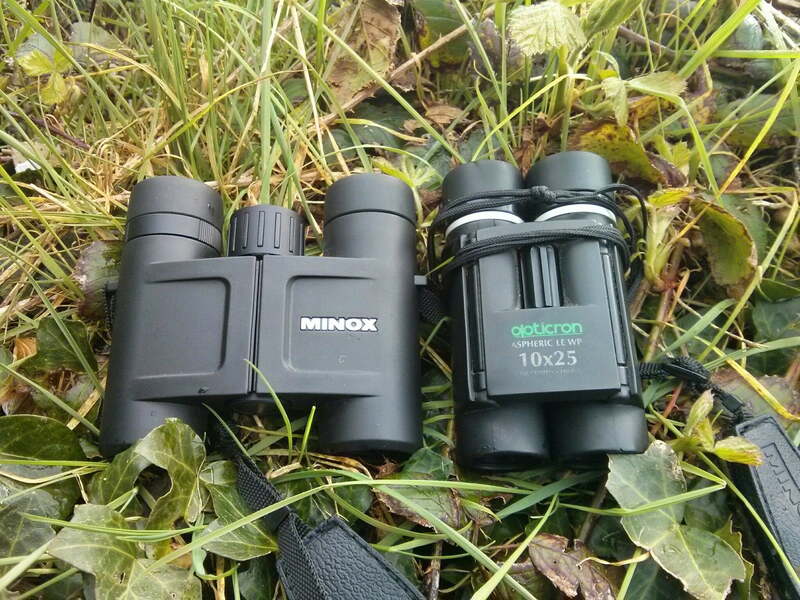 Minox is a German optics company that you probably know for their production of tiny “spy cameras” (all very James Bond) — but the company has also been making premium quality viewing optics for decades, and offers a wide range of binoculars and spotting scopes suitable for birding and wildlife observation. Their BV compact series come in 10×25 and the 8×25 configuration reviewed here. These compact binoculars certainly live up to their billing: they are, in a word, compact. When you take them out of the box the first thing you notice is their size… they really are small. They employ a single hinge design and have large twist up eye cups and a comparatively large focus wheel for a compact — traits that make them feel much more like a standard binocular in the hand. As you’d expect from a company with Minox’s reputation the 8×25 BV feels very sturdy and well made. This is a small binocular that feels built to last. The BV compact’s aluminium chassis is covered in a hard rubber armour that feels pretty tactile and offers both protection and a decent grip. It is smooth, without the grippy texture you sometimes find on rubber armour — but it makes the binoculars comfortable to hold and offers plenty of purchase even if things get a little wet. There are a couple of “grooves” on the underside of the armour, which I presume are the equivalent of thumb-indents — however, for me at least, they didn’t really do much to help with my grip of the binocular. According to the Minox website the BV compacts are designed by German car manufacturer Volkswagen — as are the striking and very functional Minox BD 7×28 reviewed here. However while the BD 7×28 really is a stand-out design for a compact binocular, I can’t really say the same for the BV. It looks like pretty much as you’d expect a single-hinge compact roof-prism binocular to look. That’s not a criticism — the design is functional, looks good and you’ll find everything where you expect it to be. It’s just that when you see “Design by VOLKSWAGEN DESIGN” as a prominent part of the product spec you perhaps expect something a bit more out of the ordinary. In use the Minox BV 8×25 feels much more like a full size binocular than most compacts I’ve used — thanks mainly to the single hinge design, the large rubber-coated eyecups and the comparatively large focus wheel. The only thing that detracted from their handling comfort for me was the positioning of the metal lugs the strap attaches to. When I hold the binoculars normally these lugs dig into my hands, making them uncomfortable to hold for long and forcing me to shift my grip to one that feels less natural. Everything about the binocular feels solid and well put together. In terms of build quality it’s hard to fault Minox here. The single hinge Minox BV 8×25 next to the folded dual-hinge Opticron LE Aspheric 10×25. The BV compact uses a single hinge design much the same as traditional full-size roof prism binoculars. The single hinge makes them more like a “normal” binocular in use than the popular “double hinge” compact design, where each barrel is attached to the central “bridge” independently. Single hinge compacts are easier to handle in the field. They’re less “fiddly”, and because you leave the central hinge set to the right width for your eyes you can always just grab your binoculars and quickly be on a passing bird or distant animal. The dual hinge design means that the barrels of the binocular can fold in underneath the central bridge, making the resulting package much more pocketable and portable than the single-hinge equivalent. For me the real advantage of a compact is the fact that they’re small enough to take anywhere — and here the double hinge design wins hands down. That said many people prefer the convenience and more robust feel of single hinge compacts like the Minox BV series. The four-stop twist-up eye-cups of these BV compacts from Minox offer a maximum eye relief of 15.5mm — which should mean they work comfortably for most people wearing glasses. 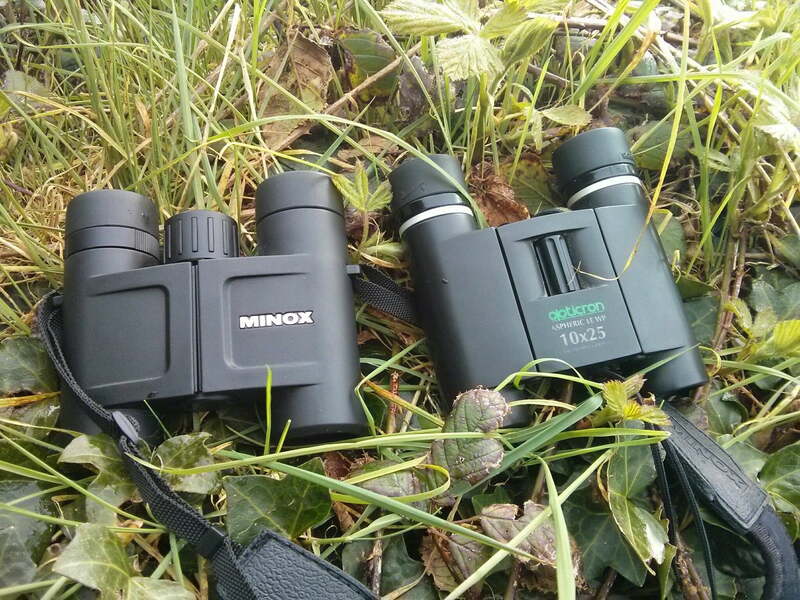 As you’d expect in a roof prism binocular at this level the Minox BV compact is fully nitrogen filled and sealed, making it completely waterproof, corrosion resistant and fog-proof — which are always important consideration here in Ireland. Minox rates the binocular as fully waterproof to a depth of 3m, which if course means that the internals should be impervious to dust, sand and other foreign bodies too. Opened out the size of the Minox BV 8×25 and the Opticron LE Aspheric 10×25 is very similar. The overall image quality delivered by the Minox BV 8×25 is very good for a compact, and is testament to the quality of the components used in the optical system. Compact binoculars are never going to match the light-gathering capabilites of binoculars with much larger objective lenses, but the view through these binoculars is reasonably bright (although I was quite surprised to find them not as bright as my 10×25 Opticron Aspheric LE). They deliver good contrast, with a reasonable level of detail once you pin down the focus point (more on that a bit later). However I can’t help feeling the image should be a bit better; it could be sharper, and colours could be a little more natural. Low light performance is never going to be the strong suit of compact binoculars, but the BV Compact performs reasonably well, into twilight… much better many compacts I’ve used. At 119 m at 1,000 m / 6.8° the field of view of the 8×25 BV is very good for a compact binocular, and up there with the best available. What’s more the image stays sharp almost all the way out to the edge of the field, with only minimal softening apparent right out at the periphery — which is excellent at this price point. The colours rendered by the BV compact are quite natural looking when you use the binocular in isolation, and good contrast means that you can pick out quite subtle variations in hue, which can be vital if you’re using them for birding. To my eyes however there is definitely a slightly warm / yellowish colour cast if I look closely. It’s particularly noticeable when using the BV compacts alongside colour-neutral binoculars. It’s not particularly distracting, but it is there. Chromatic aberration (the colour fringing that can appear around high-contrast subjects when viewed through binoculars) is practically non-existent. It was very difficult to induce in any situation, and certainly isn’t going to be a problem during normal use. They also handle glare and stray light very well for a compact binocular. This is the one area that I think really lets the BV compact down. I simply couldn’t get on with the over-aggressive focus mechanism. It’s extremely quick, and coupled with a relatively shallow depth of field meant I found myself overshooting the point of focus time and time again. I’d keep “hunting” back and forth for the best image rather than enjoying the view. That quickly becomes tedious in the field and would put me off using the BV compact for anything more than casual observation. It’s a shame, because the focus mechanism itself is very smooth and precise, and the large focus wheel with its embedded rubber ribs is very comfortable to use. But with just under one full anti-clockwise turn from close focus to infinity the focus is simply too fast and sensitive to allow for accurate fine-focus adjustment. Another point worth mentioning here is the close focus distance. 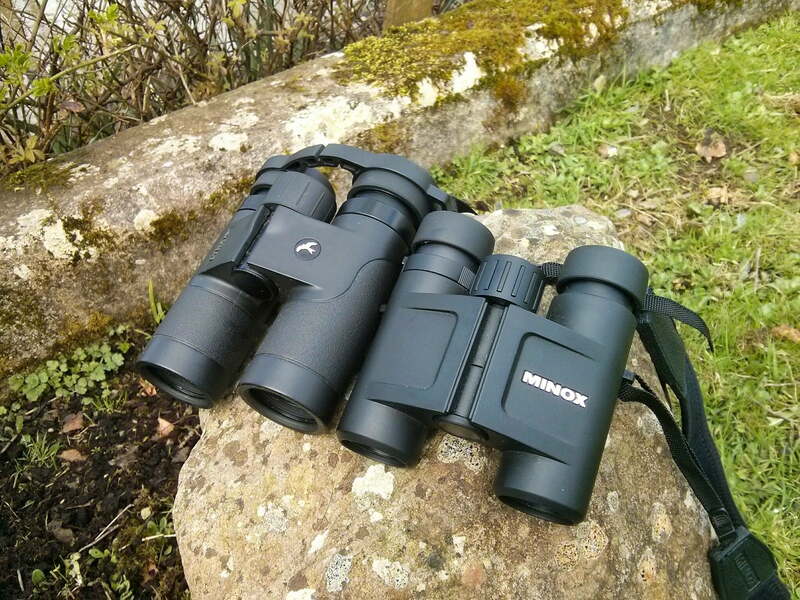 The binocular specs quote an impressive 1.5m, but the pair I was sent for review only focuses down to a much more pedestrian 2.5 m. That’s still plenty close enough for most situations, but I was surprised that it was so far outside the specified value. The dioptre correction that allows you to adjust the binocular for differences between your eyes is in the usual position below the right hand eyepiece, and is a simple “twist to adjust” ring. It is stiff enough to ensure you don’t accidentally change the setting when carrying the binocular around or putting it in and out of the case or your pocket. As you’d expect in binoculars of this calibre from Minox the BV compacts are fully-multi-coated — which means all air to glass surfaces in the optical system have been treated with multiple layers of special anti-reflective coatings to improve light transmission, increase contrast and reduce stray light and glare. On the Minox BV product page the 10×42 and 8×42 models specify they have phase corrected coatings added to the BaK-4 roof prisms (a special coating applied to high-quality roof prisms that improves the colour, contrast and detail in the resulting image). The 25mm compact models don’t mention phase correction in the blurb or specs — so I suspect Minox has elected to omitted phase correction on the compact models to keep costs down, and has sacrificed a little image quality in the process. That’s unfortunate, because in my experience phase correction is one of the things that can make a real different to the image quality of roof prism binoculars. The Minox BV compact is supplied with a cleaning cloth, an excellent padded neoprene neck strap and a very well made padded carrying case. There are no covers for the objective lenses or eyepieces included. The BV line from Minox comes with the company’s impressive “Comfort Service” warranty. It covers the binoculars against manufacturing defects and functional failures for 30 years from the date of registration. To activate the warranty you have to register your product with Minox within 30 days from the date of purchase. 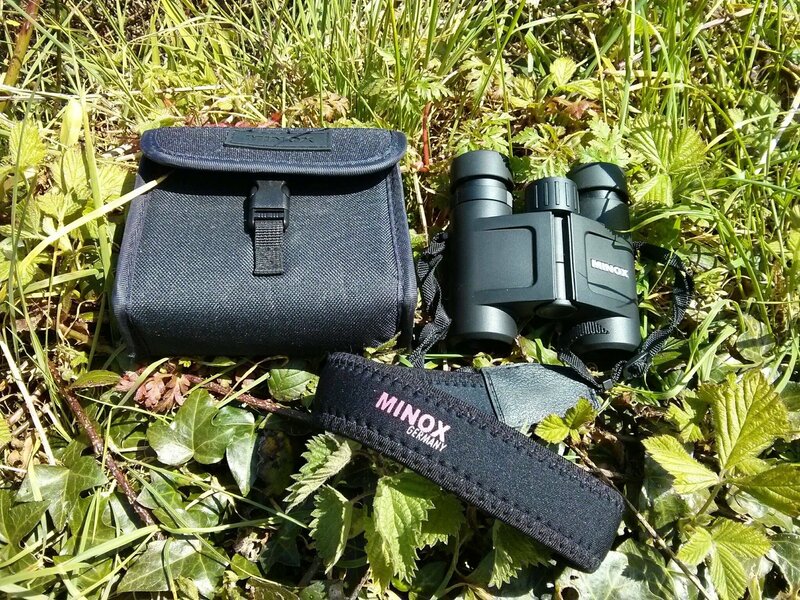 The Minox BV 8×25 BRW is a good all-round compact binocular, and would be an excellent choice for anyone looking for a good all-rounder for walking, hiking or cycling, or who want a decent second pair of binoculars to keep handy in the car, or to take with them when a full size binocular just isn’t practical. It ticks a lot of the right boxes, and is without doubt a quality optical instrument. It ticks a lot of the right boxes, but there are a few things that let it down — the main ones being the apparent lack of phase correction on in the prism coatings, and the over-aggressive focus mechanism. That said the BV 8×25 is a certainly a quality optical instrument that’s built to last, and performs well above average in most respects. It is certainly worth considering if you’re looking for a single-hinge compact in the €150-€200 price range. 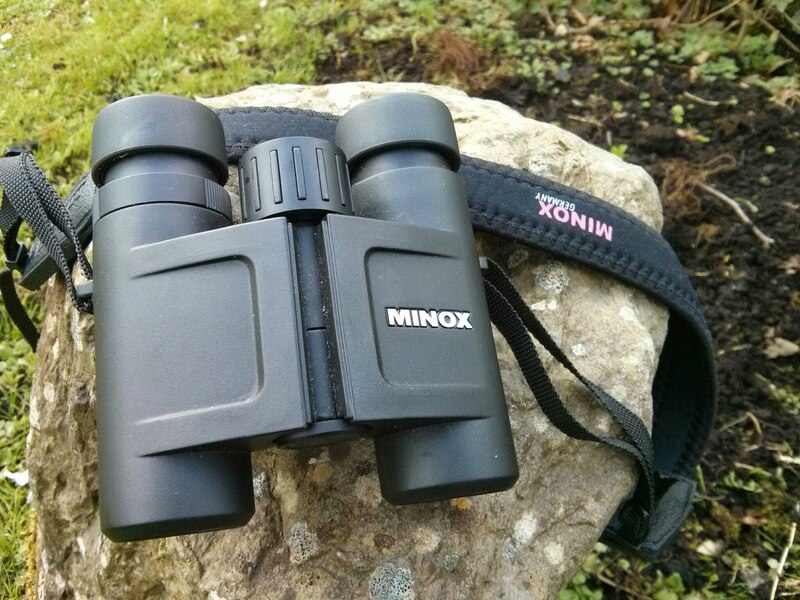 I’d like to thank Minox UK for submitting the BV 10×25 for review on Ireland’s Wildlife.